The Night Pirates is the best-selling picture book full of adventure on the high seas and a quest for treasure from Peter Harris and Deborah Allwright. Now complete with audio book narrated by John Sessions. One night, young Tom is awoken by noises outside his house. He peeps out of the window and what should he see but PIRATES. And stranger still - they're GIRL PIRATES stealing the front of his house! Tom joins their adventure across the high seas to an island where some rather lazy and silly grown-up pirates are guarding their treasure. Not very successfully! Tom and the girl-pirates make a surprise attack and are soon off on the seas once more with the treasure! This swashbuckling pirate story from Peter Harris and Deborah Allwright has become a modern-day classic. 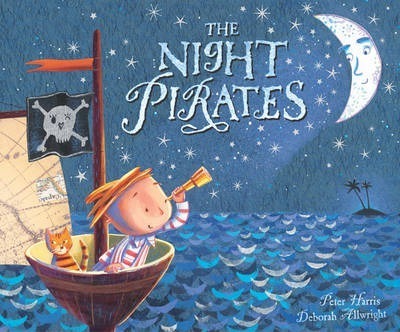 Great fun to read-aloud and entertaining for both boys and girls, The Night Pirates is a bedtime story to inspire the imagination. And with this audio book ready by John Sessions, children can read along or listen at bedtime over and over again.